It’s time to harness data. The Democratic Party has often borrowed from the labor movement’s innovations in mass organizing. 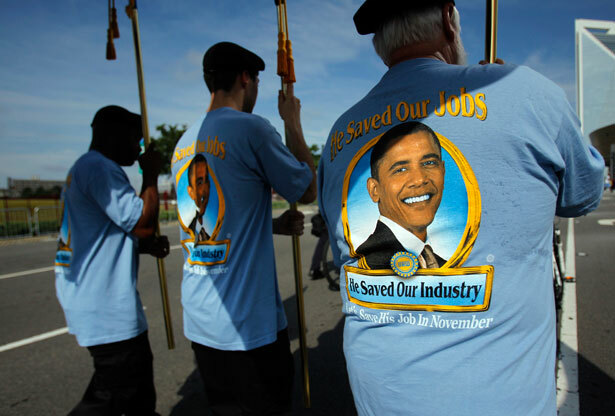 But in the last two presidential cycles, the Obama campaigns have clearly out-mobilized the labor movement. So here’s one idea for organized labor: Why not take a page from the Democratic Party and the Obama campaigns of 2008 and 2012 in their use of “big data” and experimental evidence-backed micro-targeting? The labor movement probably cannot match the scale and sophistication of the Democratic Party and the tech-progressive community in the short run, but it has access to something nobody else does: workplace relationships and networks that are more diffuse than those based on shared ideology, partisanship or residence. Instead of having to use voluntary networks that are self-selected, the labor movement has access to people who don’t necessarily share the same political beliefs or information. Unions are thus in a unique position to escape progressive bubbles and engage people in ways that last beyond the next election cycle. Many unions already collect data on their own members and could, by combining it with the voluminous amount of existing data on individuals, employers and industries, construct smart and strategic campaigns to organize workers. Data on workplace grievances could be analyzed for patterns, to find employers and managers who are easy targets for mobilization. Potential workplace leaders and stewards could be identified from existing political data and past organizing successes. Some unions are already making this kind of strategic use of data, and indeed some of the Democratic Party technical expertise came from the labor movement. But it has largely been confined to electoral rather than workplace organizing. After some basic facts are gathered, workplace organizing drives could be informed by rigorous, randomized experiments on which organizing strategies work and under what conditions. Organizers have a set of tactics in their heads and in their unions, but few of these strategies have ever been quantitatively evaluated in terms of organizing effectiveness (Kate Bronfenbrenner’s research is an exception). Union cards signed and union-recognition votes won provide natural metrics for evaluating success. No statistical model is a substitute for the talents of dedicated and experienced workplace organizers, but they can illuminate effective organizing devices. This is one prong of organizing that doesn’t require changing the law to implement. Nor does it give up on the core project of workplace mobilization altogether. Instead, it’s about harnessing the digital and computational tools of the twenty-first century, together with comprehensive campaigns, to organize workers at the scale necessary to turn around labor’s fortunes. Suresh NaiduSuresh Naidu is an assistant professor of economics and public affairs at Columbia University.